Mr. Shine will at any length reassure its customers with strong customer support. To help bring this level of attention to customers into the website, it was important to write in detail how different each of their services were. 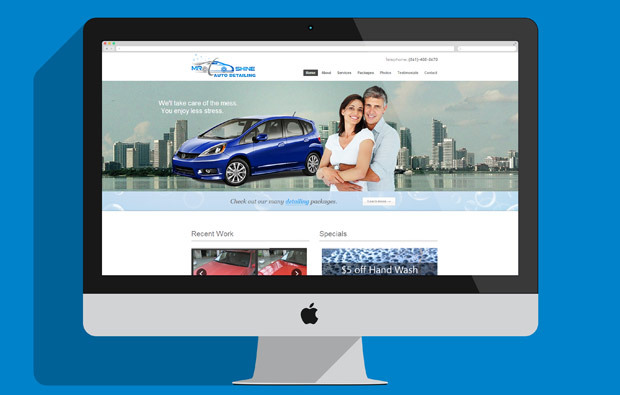 Frequently automotive websites leave the user confused as to what it is they may be purchasing. With the combination of proper imagery and detailed copy there is a complete cycle in understanding what they are purchasing and what it will look like. Our branding effort was expansive and cohesive, bringing an assured consistency across all visual platforms. The two main elements that were discussed upon briefing included the use of a vibrant blue and imagery that represented a clean efficient car in motion. We had the pleasure of creating a new corporate design with corresponding business cards. Greatly inspired by that materials used in domestic vehicles, we used a hexagonal pattern very similar to that of which you can see on a car grill. 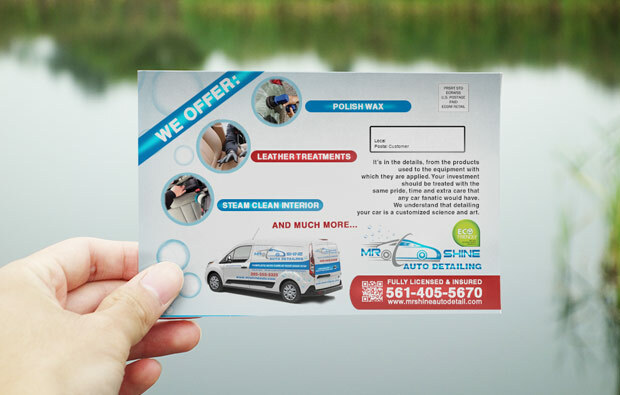 We created direct mail postcards to promote the grand opening of Mr. 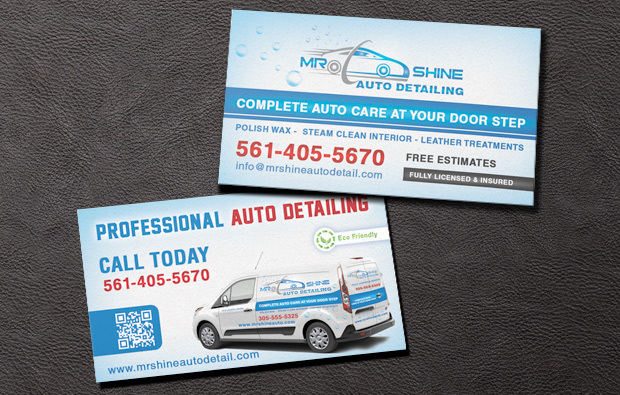 Shine Auto Dealer in Miami, Florida. 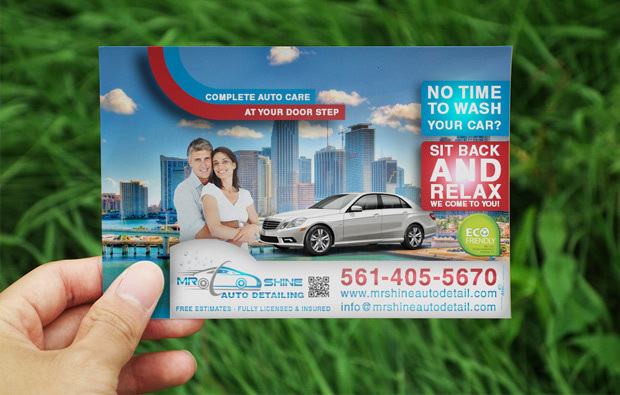 The card is very quickly distinguishable to locals in the Miami area due to the use of imagery from the city of Miami used in the background. 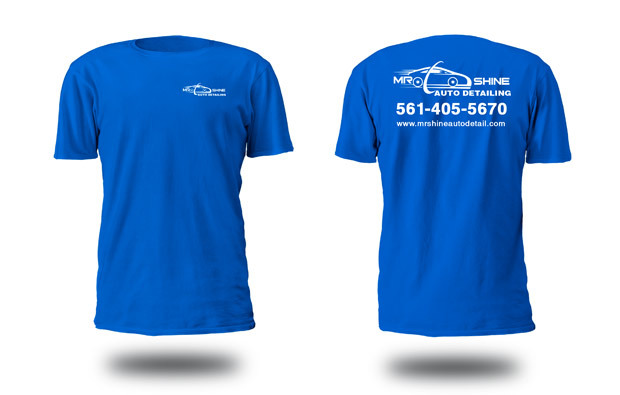 Keeping the company identity in mind, we chose to use a Azure blue as the t-shirt color. The t-shirts will work well for staff members that will induce heavy use of the t-shirts because the shirts are made with heat-transfer vinyl, which won’t degrade or fade when splashed frequently with water and soap. Mr. Shine Auto Detail wanted to show off their company colors in a colorful van. 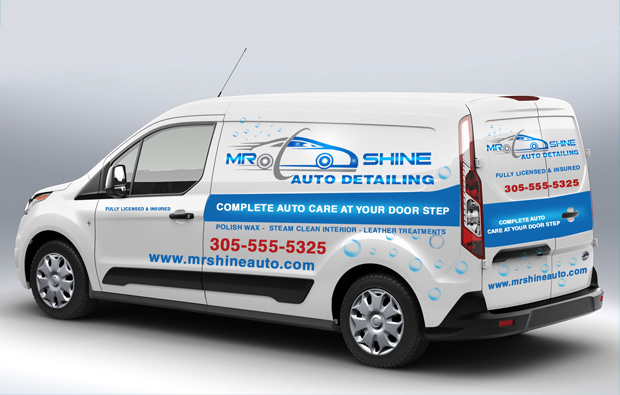 With the use of bubble imagery and the color Azure blue for the typography on the van we created a suitable van decal that is sure to express Mr.Shine’s professionalism.